What Makes a Fighting Game Good? Direct link to our schedule can be found here. CouchWarriors is proudly supporting a major Injustice 2 tournament to be hosted at PAX Australia with a prize pool of AUD$20,000! Cost: Entry to the tournament is free. Entry to the Friday session at PAX Australia required, valued at $65 – Sunday passes will be provided for anyone in the final 8 that doesn’t already have one. Tickets are available here. BRING YOUR OWN CONTROLLER There is a BYOC / Sticks policy for the event. We have some available for emergency and our friendly players will often loan a controller, but we ask you to please bring your own! The event will feature a $16,000 prize pool including a custom built Arcade Cabinet, and for the winner, a trip to Red Bull Kumite in Paris! We will be hosting qualifying events in Melbourne, Sydney, and online, and assisting with the main event. Sign up for the event including online qualifiers below! PAX Last Chance Qualifier: Friday 27th 11:30am at the Console tournament area at PAX Australia. Register on the day. Limited places! Top 8 move to Play in on Throwdown Stage. Battle Arena Melbourne 9 Cosplay Competition Announced! We are pleased to announce Battle Arena Melbourne 9’s official cosplay competition! Join us in your best fighting game costume for a chance to win some awesome prizes. Not only is BAM Australia’s biggest fighting game event, it’s a gaming and esports festival, so we would like to invite everyone to appear in character! Photography: On the floor of BAM9, we will have a special photo wall and photographer onsite, so there’ll be great shots to come from the event. Cosplay Changerooms: There will be a dedicated space off-floor for Cosplayers to change. Just register in person at the Registration Desk. Event Entry: Only a spectator pass ($20 for weekend) is required. CouchWarriors at PAX AUSTRALIA 2015! 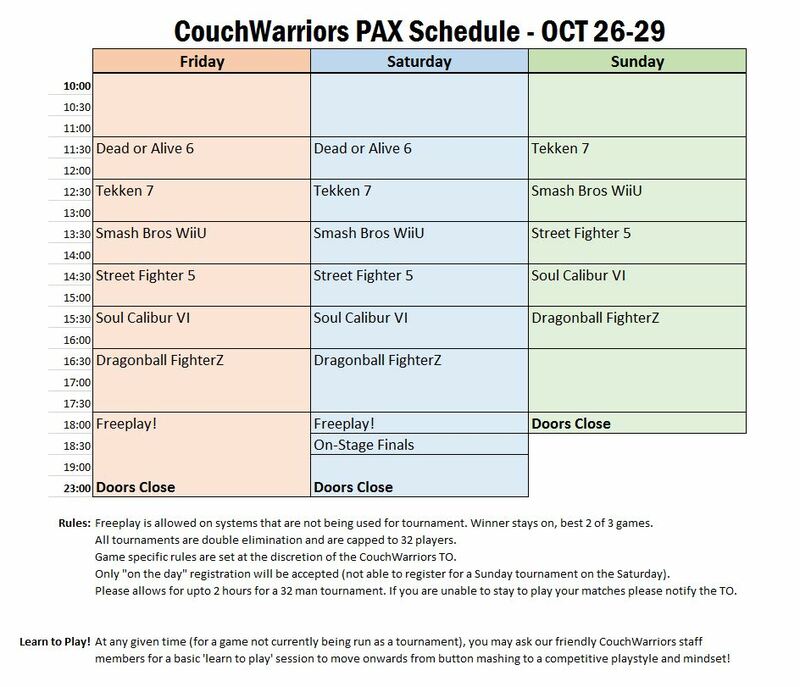 CouchWarriors is proud to be providing the Fighting Game Tournaments services for PAX Australia 2015 this coming weekend Oct 30- Nov 1! Related panel: Travel the World Playing Video Games – Are You Crazy? Featuring CouchWarriors president Daniel Chlebowczyk and BAM7 USFIV champion Xavier Nardella.